and hot sealing are available. PVC canvas banners are great for both indoor and outdoor use and can be printed to any custom size. Printed at 720dpi, the images turn out vivid and in brilliant clarity. This material is durable and can withstand highly rugged usage conditions. * Prices quoted in Singapore dollars. 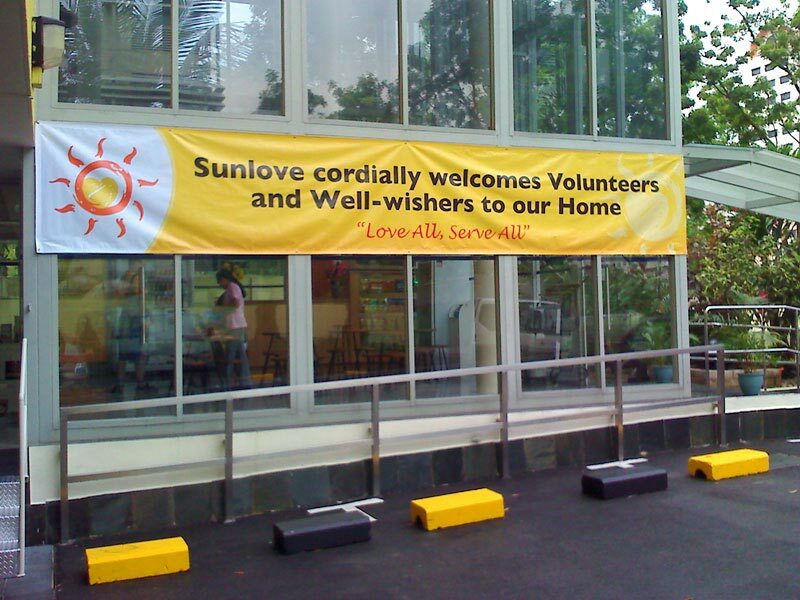 PVC Canvas banners are highly popular and commonly used for banner printing in Singapore. This material is sometimes referred to as tarpaulin or tarp (which is the material usually used for awning or camping tents), but usually customers would just refer to it as outdoor banners. This shows how ubiquitous the material has become for outdoor usage. They are chosen for use especially in outdoor areas, due to the durable nature of the PVC Canvas material. It is the material you would choose for the most rugged of usage. It is able to withstand rain and sunshine for extended periods of time, without deteriorating rapidly in material quality or print quality, unlike other materials. 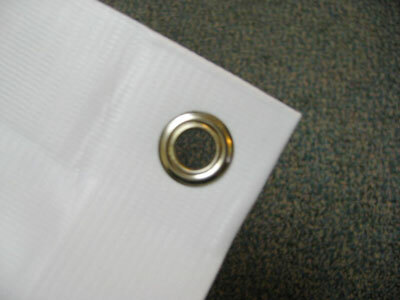 It is also highly tear-resistant, which means it does not tear easily. And you would have to try really really hard to tear it up by accident. PVC banners are also highly economical. 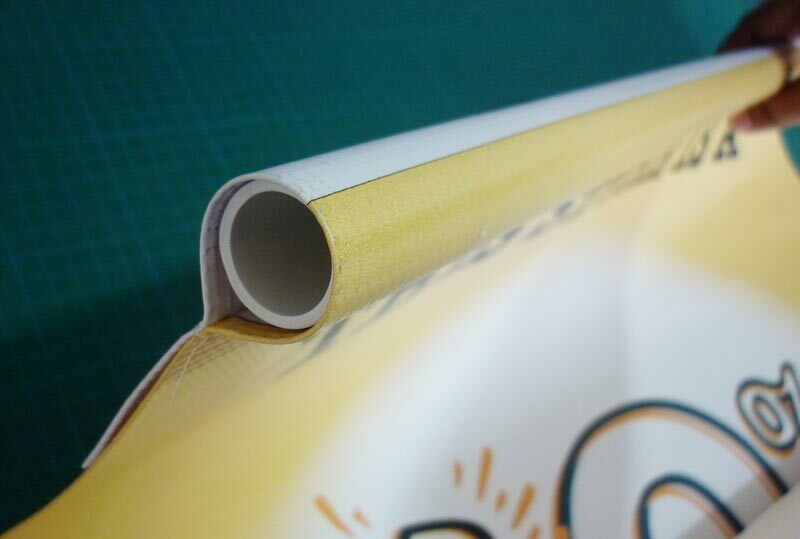 Unlike photo paper or poster prints, PVC banners do not require surface lamination to protect the print surface. We also print plenty of outdoor PVC canvas banners, so the bulk quantity of orders enables us to keep our prices down even further. We have had a customer submerge a large PVC banner at the bottom of a swimming pool for 3 days, and the material and print remained intact till the end of usage. 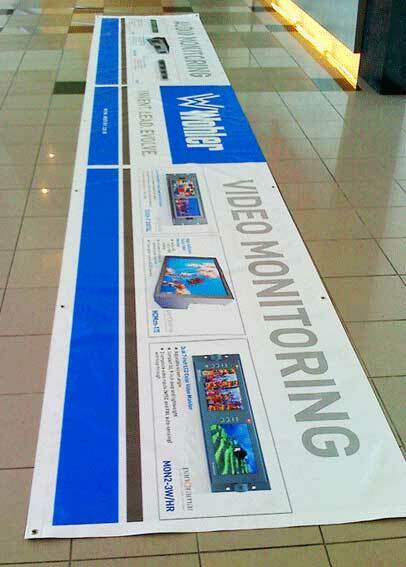 This proves the waterproof nature of the material and the long-lasting quality of the print on outdoor PVC banners. PVC Canvas banners can also be printed in extremely large sizes, and this is important for use in outdoor areas, when the banner is placed at the side of a building or along a huge wall. 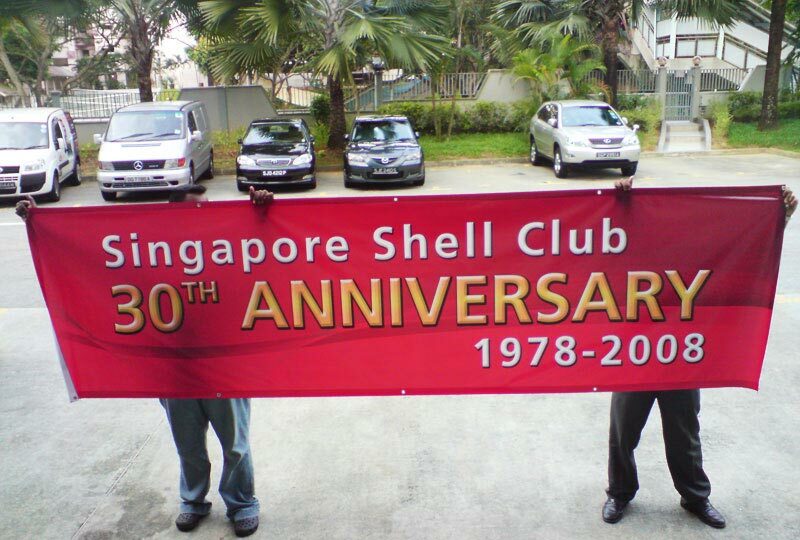 You would need the banner to be large in order to be noticeable and to draw attention from onlookers. The maximum printable width of the material is 3 metres and one complete roll of material can be as long as 30 metres. This means that you can have a single piece of PVC banner that measures 3 metres by 30 metres without requiring extra sewing to piece it together. Having said that, if you should require a bigger size, say 5m x 20m, we can still get it done by printing 2 pieces of 2.5m x 20m and sewing the 2 banner pieces together. The sewing is done very neatly such that it is almost seamless to the observer. 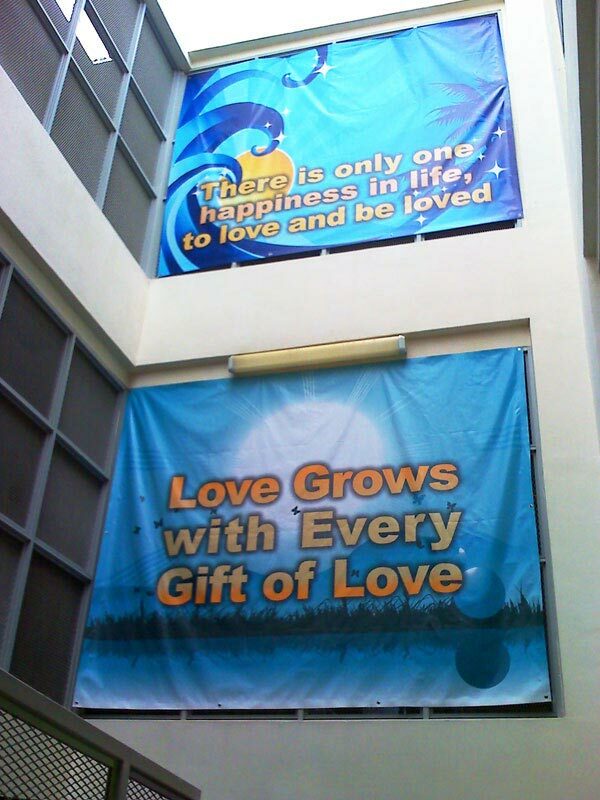 PVC banners can be used in a large variety of ways. They can be hung on fences, walls and entrances or they can be propped up by many of our display stands, such as the clip banner stand, x banner stand, or slot banner stand. The material is easily rollable, so you can roll up the outdoor PVC banner easily when it is not in use, and have it stored away compactly without taking up too much space. 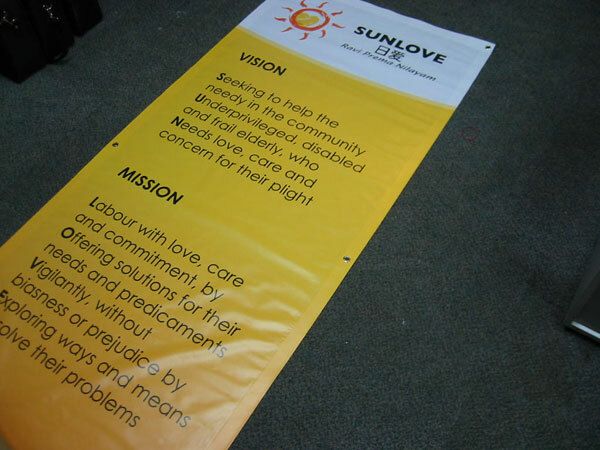 The material holds colours beautifully, and you can be assured of the best printing quality with our outdoor PVC banners. Do let us know the dimensions of the banner you would like to print. This is in the form of width x height. Some standard sizes we usually produce are 3m x 1m, 60cm x 160cm, 5m x 2m. But there is no hard and fast rule and the outdoor PVC banner can be customised to any size you like. Measure the area where you will place the banner so it will fit nicely when you place it up. Do let us know the quantity you require. There is no minimum quantity, and we print as little as 1 piece only. If you are printing in bulk quantity, do let us know, and we will factor it into our quotation. There is usually a discount for bulk purchases. We will need you to provide us with high-resolution, print-ready artwork in a suitable graphic software such as Adobe Photoshop, Adobe Illustrator or PDF file in order to print it clearly and correctly. If you do not have print-ready artwork, do let us know too so we can advise you of the charges for design work done by our team, and of the extra time required to complete the artwork. 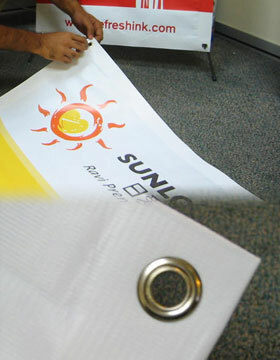 We intend to make the process of printing your outdoor PVC banner as fuss-free and enjoyable as possible. Feel free to call us or email us for a discussion if required.